I’m often looking for recipes that A) are more plant based; and B) the family will eat without complaint. This definitely fulfilled both of those! This is very fast and simple to make, but you will need a food processor. You can easily substitute some of the ingredients to suit your tastes, or to add some variety if you have it often. When I made this I served it with normal hamburger buns or the option of butter leaf lettuce. I had mine on the lettuce, as did most of my guests, and we all loved it! I had also made my raspberry ketchup that afternoon, which really set off the flavors in the burger! Yum. If you are vegan and are looking for an alternative hamburger bun I highly recommend these from Sami’s Bakery! They are wonderfully soft and fluffy, and taste great. I have heard from others that they freeze/thaw very well, so can be purchased in large orders and stored in the freezer (although I have not tried this myself). This is NOT a great option for those who have Celiac Disease, as Sami’s is NOT a gluten free facility…. Place onto a lightly greased baking sheet; patties should have a little space in between them; bake for 10-15 minutes; flip and bake another 10-15 minutes. These should be slightly crispy/firm on the outside, but soft inside. 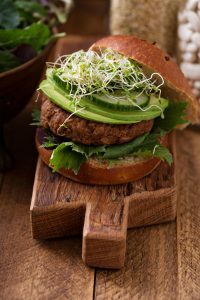 Top with your favorite burger toppings such as spinach, avocado, tomato and condiments!